Founder of the Center For Book Arts in New York City, Richard Minsky's often elaborate sometimes shocking but always conceptually intriguing bindings push the boundaries of both book and artwork. His works explore the readability not only of the interior of literary objects but through the transformation of their exterior, cast an invocation of abstract concepts that defy containment. In 2009, Minsky created Freedom of Choice, a work that some would race to classify as installation rather than a fine binding. However, consider the language used by Minsky in his own discussion of the work and re-examine the work's "contents" (which would in this case be exterior to the book itself) from the perspective of a cabinet of curiosities, and the work is unmistakably a bound book. Taken from the artist's website "Copy No. 1, above, is printed inkjet on J. Barcham Green handmade paper with a 1976 watermark, bound in dark teal goatskin with 23K gold title, chained to an oak electric chair. On the inside of the head restraint are three electrodes, and one electrode goes to the leg. An MP3 player on the head restraint plays Minsky's reading of the three poems, two of which concern shotgun suicides and one an electrocution. On the back of the chair is a cabinet containing a 20 gauge shotgun, a Manila hangman's noose, a wakizashi sword, razor blades, poison and a hypodermic syringe." The Bill of Rights is a set of fine bindings Minsky has been working on since 1993. The books, sold and displayed as a unified collection, examine concepts as vast as freedom, war, religion, the future, the criminal justice system, and our political history while utilizing challenging, thought-provoking structures in dialogue with these concepts. 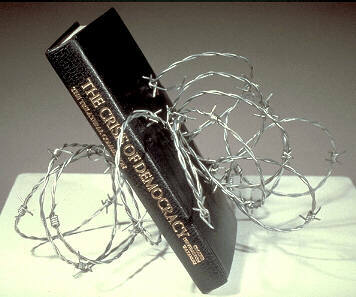 Crisis of Democracy is a transformed paperback bound in sheepskin and held upright in a barbwire stand positioned, according to the artist, in a way that reading the book, "slowly erodes the decorative surface of the skin." Here, not only is the display of the artwork taken into considering as ancilirary to the book, but it is inseparable and integral part of the book's logos. The Geography of Hunger may well be regarded as much a book sculpture as an artist's book. As the artist himself describes the piece, "The author was Chairman of the Executive Committee of the Food and Agriculture Organization. His conclusion is that the countries of the world are all capable of feeding their starving populations, but don't for political reasons. 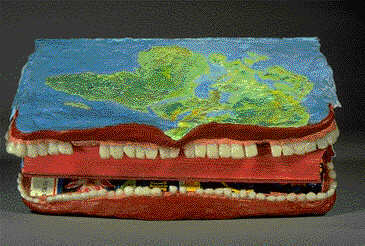 The binding is moulded and carved plastic, with a world map in acrylic paint-- the mouth of the world. The endpapers are labels from food cans bought at my local bodega, from countries where the people are starving and we get their food, and labels from Mighty Dog Gourmet Dog Food, because in this country there are old people who eat dog food and dogs who eat better than many people in the world."